COPPER MOUNTAIN ” After more than a year off the hill rehabbing his knee, Breckenridge skier Matt Philippi once again made his mark on the U.S. Freeskiing Open. Unfortunately, he had to settle for second place, as Canadian Justin Dorey set a new mark for highest score ever in a U.S. Open final. All in all, it added up to an exciting finale at Saturday’s competition on Copper Mountain’s Main Vein superpipe. Dorey stomped a run of 96.6 to dominate the field, while Philippi snagged second place with a score of 92.8. Though both skiers were arguably among the favorites entering the 12-man final ” as Philippi qualified in first place and Dorey has long been among the top in the sport ” neither of them would have guessed the outcome at the start of the day. Philippi, the 2007 U.S. Open runner-up, missed all off last season after blowing out his right knee just before the X Games. And in Dorey’s training run Saturday, he took, what he called, “one of the worst crashes” he’s ever had in the pipe. It appeared to be the right decision when he jumped out of the gates and nailed a double flip on the first hit of each of his first two runs in the finals. He finished off with a switch 1080 before stomping into the flat of the pipe for the win. Dorey’s win ended a near three-year personal drought, as he’s finished second in nearly every competition this season. For Philippi, second place felt like a win, especially with Dorey breaking the old scoring record by more than two points. “That’s the best run I’ve done in my life,” a jubilant Philippi said of his first run where he started with a switch 1080 tailgrab and ended with a 1260. 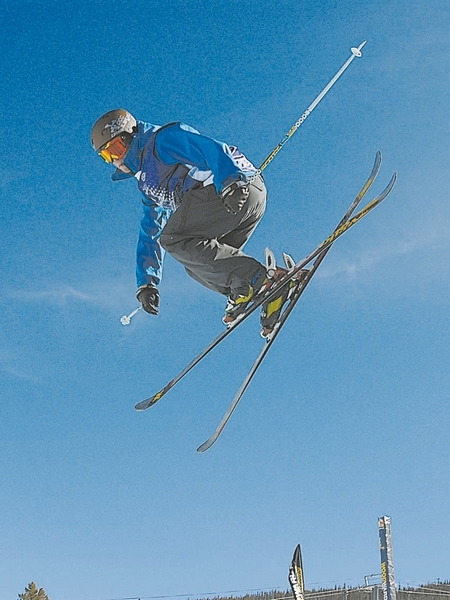 Local Copper Mountain skier Taylor Seaton, 18, got a good look at the best of Saturday’s competition, as he was the next skier after Dorey’s record-setting run. Seaton put together a solid third run and finished in fourth, a mere point behind third-place Mike Riddle. Aspen’s Peter Olenick struggled to a 12th-place finish, while 16-year-old Breck skier Duncan Adams finished in sixth.